With my dogs Toby, Dexter and Benny. I have published four novels - coming-of-age novel The Truth about Tomorrow, which won WriteIntoPrint's Captivating Opening Contest in 2017, love story Yours Remotely, mystery novel A World Other Than Her Own, and contemporary romance Sympathetic Strings. I have varied tastes as a reader – some of my favourites include Stephen King, Diana Gabaldon, Susan Cooper and J.R.R. Tolkien – and that variety also comes across in my writing. I write in several genres, so I must apologise if after reading one of my books you discover that the others are not similar. I hope that once you have discovered my real-to-life characters, flowing language and story construction are something that you enjoy, you will be able to see past genre limitations. This is where I like to write. People often ask for sequels to my books. Again, I'm sorry to disappoint. I write my stories because certain characters have taken up residence inside my head, and the only way I can get them to leave is by writing their story. Nobody has, so far, decided to stay inside my head on a permanent basis. Once I've finished their story, they move out and leave me alone. That's why writing series is not my thing. Perhaps, one day, someone will come along who won't leave me quite so quickly, but at the moment, all my books are stand-alone. Imagine the freedom of fleeting from book to book and character to character though! So many worlds and possibilities to explore! Apart from writing, I spend my spare time with my dogs. 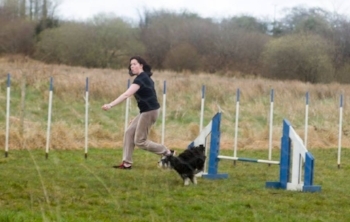 I've been doing agility since 1993 – with different dogs, of course, because these dear creatures have such short lives – and am lucky enough to live in the Irish countryside and to have a garden large enough to fit a full-size agility arena where I can train my own dogs and accommodate our local club's agility classes. I love music, particularly rock, as you will discover if you read my stories. I travel all over the UK and Ireland to see bands most people have never heard of. My top three – in no particular order – consists of Muse, Young Guns and the late, the great Fearless Vampire Killers.